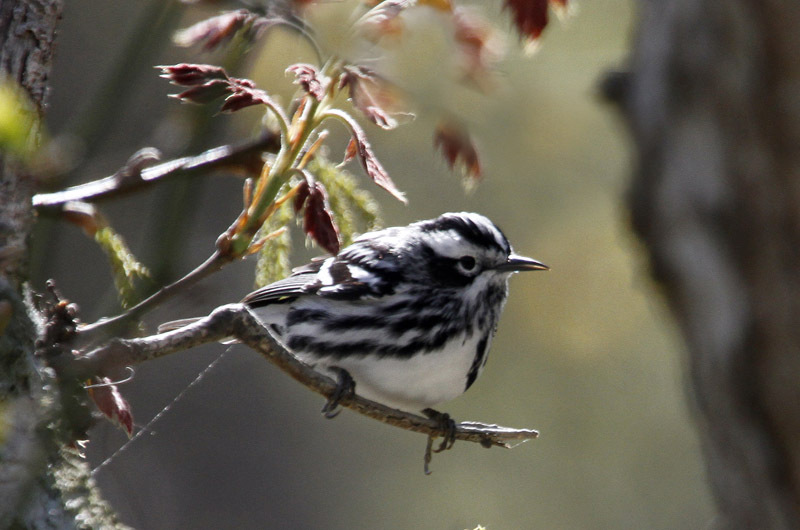 A black-and-white warbler, one of 10 warbler species that breed on the Vineyard. 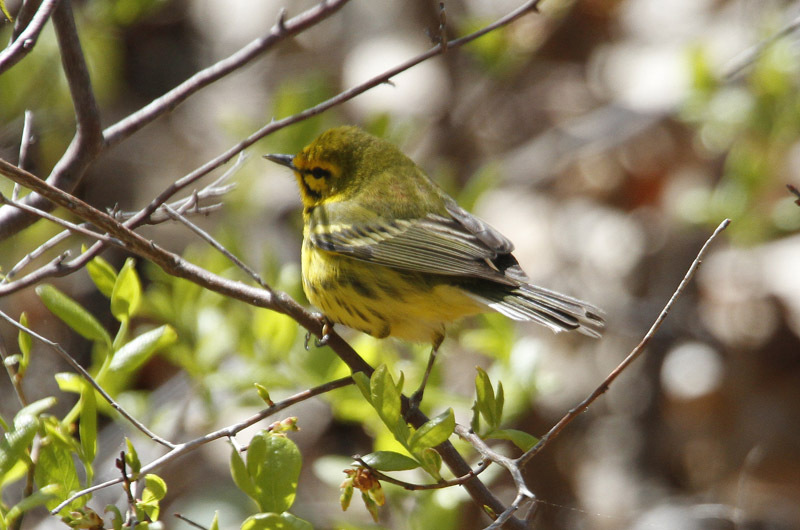 The populations of nine of the 10 species of warblers that breed on the Island are declining. This is not good news for those of us that hope these birds will be around for a long time. Fortunately, science has isolated possible ecological causes for these declines. They have used recoveries of birds banded as part of a nationwide banding project known as Monitoring Avian Productivity and Survivorship (MAPS), which can be used to document nesting productivity, migratory survival and winter survival, and to determine which of these areas are most important to reverse these declines. Increasing the survival of warblers on their non-breeding grounds is the most frequently cited way to enhance their populations. This is the case for five of the 10 Vineyard-nesting species: ovenbirds (the only one of the 10 species to have an apparently stable population in Massachusetts), American redstart, black-and-white warbler, black-throated green warbler (the only one that may no longer breed on the Vineyard), and yellow warbler. Increasing the number of young fledged during the breeding season is cited for three species: northern parula (the only one of these species listed under the Massachusetts Endangered Species Act), pine warbler, and common yellowthroat. The latter two species are considered to be common on the Vineyard. Increasing the quantity of appropriate breeding habitat is the recommendation for two of the species, blue-winged warbler and prairie warbler. The former requires early successional shrubby habitats for nesting, while the latter requires an open woodlands habitat. A caveat to this information is it does not mean that everything is okay in the areas that are not mentioned. Obviously, survival throughout the year and the number of young fledged per nest are important and need to be enhanced to ensure persistent populations — especially since nine of the 10 warblers are experiencing population declines. This data is presented on The Institute for Bird Populations website, vitalratesofnorthamericanlandbirds.org. I also used Mass Audubon’s 2011 report called State of the Birds. We are still at close to the peak of the breeding season, with lots of baby birds. Meanwhile, we are between the spring’s northward migration, which ended a few weeks ago, and the southward migration which is about to start. The breeding season in the Arctic is so short that the shorebirds nesting there do not have a chance to re-nest if their first attempt fails for any reason. So they leave the Arctic and may decide to spend their summer on Martha’s Vineyard. By July 4, the first migrants will be here, but for now the bird news is all about the breeding season. On June 10, Tim Leland spotted a great egret flying over Wasque, heading to the west. He also observed a black-crowned night-heron at the southern end of Poucha Pond. And Paul Wales has been observing a pair of night-herons every morning at Quammox Pond on Chappaquiddick, a mile or so north of Wasque near Katama Bay. And Sara Brown observed two at Butler’s Mudhole, the small pond adjacent to Sheriff’s Pond in Edgartown. Charlie Kernick and Michael Ditchfield have observed great egrets frequenting the Sengekontacket Pond marshes. Mr. Ditchfield also spotted the much smaller and now rare snowy egret in the same marsh; in the 1980s these smaller egrets were much more common than their larger cousins. The whip-poor-will is generally a welcome addition to anyone’s neighborhood. Morgan Hodgson hears them almost daily in the woods along the western shore of Menemsha Pond. They are present in scattered locales around the island, but some observers complain that their monotonous chant keeps them awake all through the night. Speaking of nighttime, videos of birds at night are not all that common. Karen Osler recorded a video of two woodcocks in her backyard on June 19. Their long beaks are clearly visible in part of the video. This species is now mostly silent and hard to observe, as their courtship flights are pretty much over for the year. On June 20, Bill Post spotted six willets in the marshes at the southern end of Sengekontacket Pond. This is more willets than he has seen in past years. Happy and Steve Spongberg also observed the willets there. They are easy to find there; just follow your ears as they are very vocal and very loud at this time of the year. Mary Makepeace has been observing chimney swifts in the afternoon between Dunham’s Road and Katama Road. She has been trying to determine which chimney they are living in, but they fly so quickly that she is finding that difficult to do so. I know these swifts—“cigars with wings” is how Roger Tory Peterson described them—are present in all three down-Island towns and also near Seth’s Pond on Lambert’s Cove Road. Eastern kingbirds seem to be abundant this year. Paul Wales reports that they are abundant at Wasque. Bill Post notes their abundance at the Edgartown Golf Club and just about everywhere throughout Katama. He has also observed yellow warblers, eastern towhees, a pair of mute swans with four cygnets and lots of catbirds. A flock of six cedar waxwings are frequenting the woods near Cynthia Bloomquist’s pond in Vineyard Haven, and Sarah Mayhew spotted the leucistic house finch that was at her feeder last summer. Her hummingbird feeder also attracts a Baltimore oriole. There are lots of birds around, so please get out looking for them, and be sure to report your bird sightings to birds@mvgazette.com. Robert Culbert leads Saturday morning guided birding tours and is an ecological consultant living in Vineyard Haven.